Researchers from Boston University and Tufts University near Boston recently demonstrated an infrared spectroscopy technique that can directly identify the "vibrational fingerprints" of extremely small quantities of proteins, the machinery involved in maintaining living organisms. The new technique exploits nanotechnology to overcome several limitations of current, conventional techniques used to study biomolecules. "It allows identification of a protein by directly analyzing its vibrational fingerprint signatures," said team leader Hatice Altug, an assistant engineering professor at Boston University. "It may lead to a new toolkit for studying biomolecules." The advance is reported in the Proceedings of the National Academy of Sciences. The National Science Foundation supports the research. Previous bio-molecular study methods commonly use fluorescence spectroscopy, where biomolecules are labeled with very bright fluorescence tags to track how efficiently they interact with each other. Understanding interactions is important for medical drug research. Fluorescence spectroscopy is quite sensitive at the single molecule level. However, the tags can be as big as the biomolecules themselves and interfere with the biomolecular interactions. "There is currently a need to develop label-free bio-detection technologies," Altug said. "Infrared spectroscopy is a label-free method, because if you tune your ‘eye' to the infrared frequencies, you can directly see the bio-molecules without any labels." 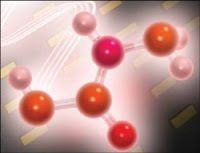 Molecules consist of atoms bonded to each other with springs. Depending on the mass of atoms, how stiff these springs are, or how the atoms' springs are arranged, the molecules rotate and vibrate at specific frequencies similar to a guitar string that vibrates at specific frequencies depending on the string length. These resonant frequencies are molecule specific and they mostly occur in the infrared frequency range of the electromagnetic spectrum. The sensitivity of infrared spectroscopy previously had been too low to detect these vibrations, particularly from small quantities of samples. The new method demonstrated by Altug's graduate student Ronen Adato and her post-doctoral fellow Ahmet Ali Yanik combines the strengths of nanotechnology and nanophotonics and overcomes the problems that prevented past use of infrared spectroscopy. "We use arrays of tiny gold nanoparticles as efficient plasmonic nanoantennas to greatly amplify the ability to detect a molecule's inherent frequency," says Yanik. With their technique, the team obtained vibrational signatures from nearly 145 silk proteins deployed at the tip of each nanoantenna. "Our technique gives researchers an ability to enhance inherent vibrational signatures more than 100,000 times," says Altug. "This allows us to sensitively study molecular structures and biological functions of extremely small quantities of molecules." Altug anticipates that these new tools someday will help researchers design drugs, minimizing the complications of life-altering diseases such as cancer and Alzheimer's. "This advancement is fundamentally important for bio-chemistry," she says. "Our plasmonic method is quite general and can also be adapted to enhance the infrared fingerprints of other molecules than proteins" said Altug. "It therefore provides a general purpose toolkit and may help amplify chemical sensing capabilities that are of particular concern to national defense."